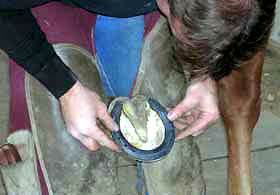 I have learned the basics of shoeing from observing and working with Tim Phillips, a farrier for 32+ years. While apprenticing with him, he taught me how to shoe a horse properly and to recognize pathologies and health issues concerning the horse's foot. I also had the opportunity to work with and learn from several other experienced farriers to further my skills & knowledge, including some award winning, internationally recognized clinicians. In addition to seeking individual training by experts, I have been constantly upgrading his skills by competing and attending highly regarded continuing education seminars and clinics. Recognizing the complexity of medical issues surrounding hoof care, I have attended also many continuing education programs over the years, such as the annual Farrier Conferences at Cornell College of Veterinary Medicine. I am a Certified Journeyman Farrier, which constitutes the highest level of AFA certification. Note: In order to service my clients better, I purchased a new truck and farrier body which enables me to have readily accessible any equipment and supplies needed, and eliminates downtime due to truck maintenance and repairs. Take a look at some pictures of my custom Dodge truck upon the delivery from Stone Well Bodies and Equipment, Inc. 625 Sills Road, Genoa, New York.